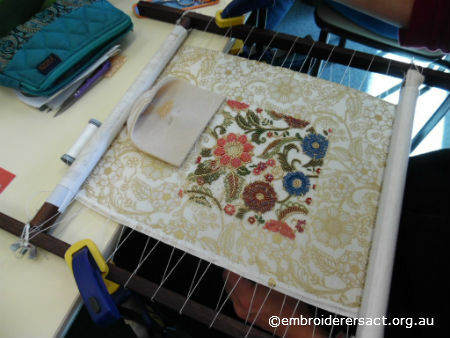 Well, it’s been a while but it’s time to catch up with the rest of the photos from our annual stitching weekend at Greenhills Conference Centre. 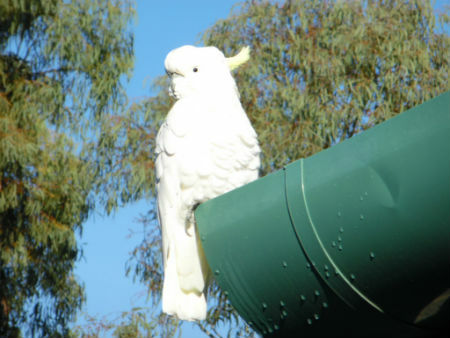 More wildlife at Greenhills 2015. 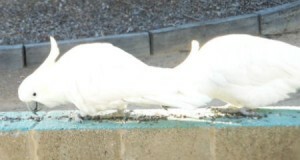 The sulphur-crested cockies were on the lookout for seeds left out by the kitchen staff. 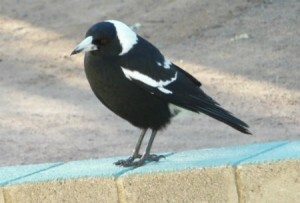 The magpie felt left out, but was not brave enough to take on the cockies. Jeanette was happy for me take this photo of her wearing her lanyard made at Stitching on the Lake, a class with Fiona Horden and SylviaFrazer. 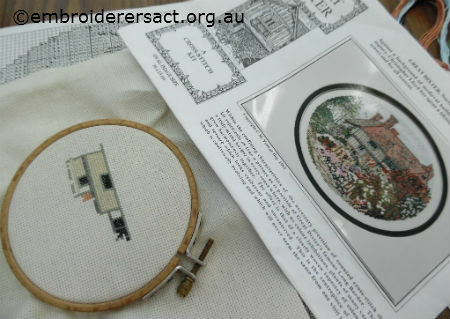 There was plenty of cross stitch happening, with a confession or two that that there are UFO’s that may have spent some time languishing in cupboards between episodes of activity. 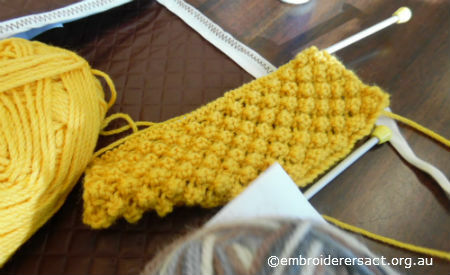 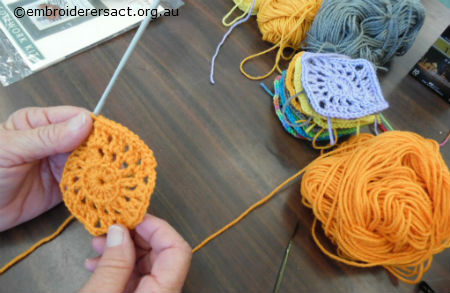 As a change from embroidery, there was some crochet and knitting going on. 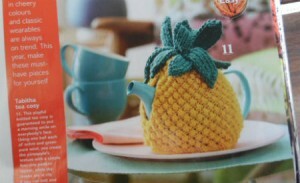 Diana has told me that this will be for the teapot used for peaceful cups of tea at a special place in her garden. 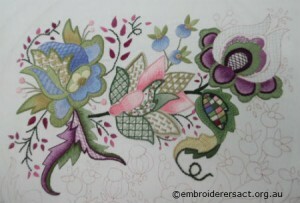 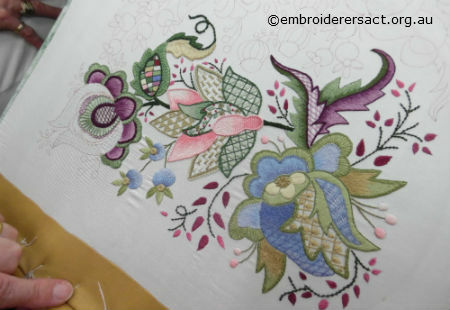 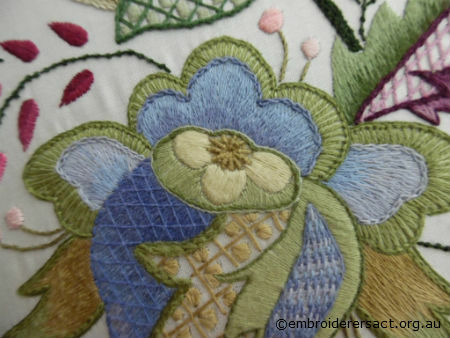 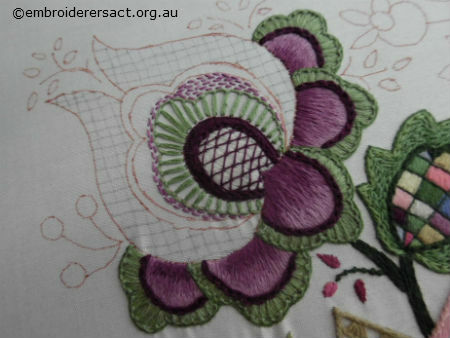 Pam Hynd was working on this exquisite Jacobean Embroidery work, threadpainting using DMC threads, from Sarah’s Hand Embroidery Tutorials. 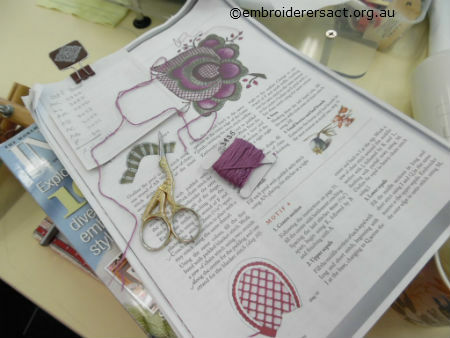 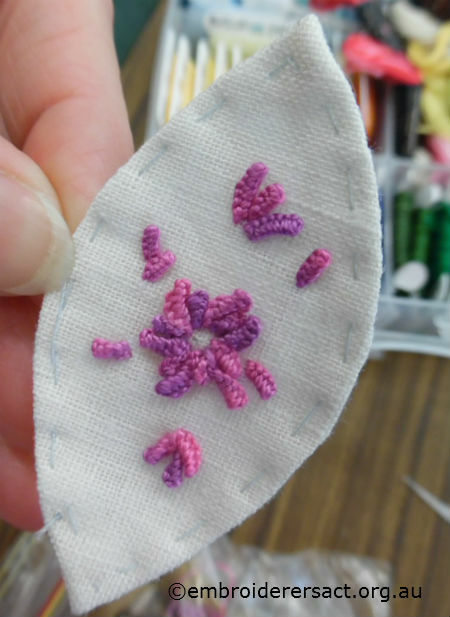 Polly Templeton also worked on this Japanese Beading project, from a class by Margaret Lee. 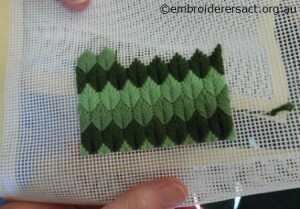 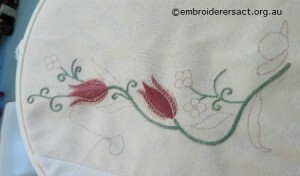 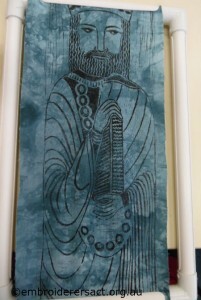 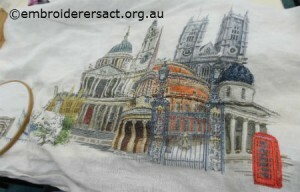 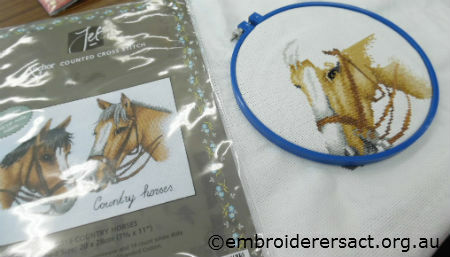 Sarah Kimmorley was working on this Crewel piece that came from a class by Carolyn Pearce. 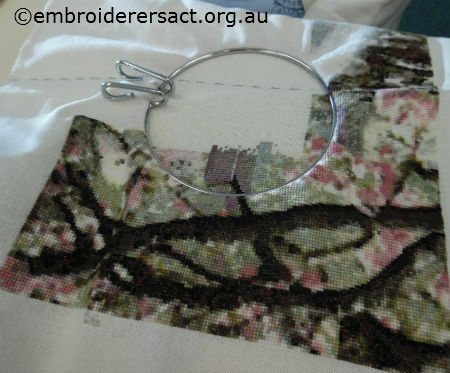 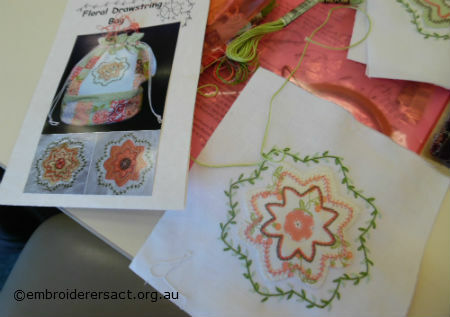 This floral drawstring bag, designed by Sylvia Fraser, was being worked on by Rhonda Howlett. Jenny Balderson was working on her Bayeux Tapestry panel. 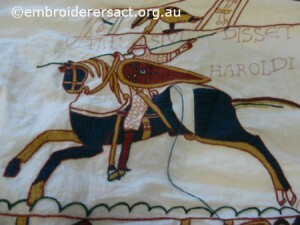 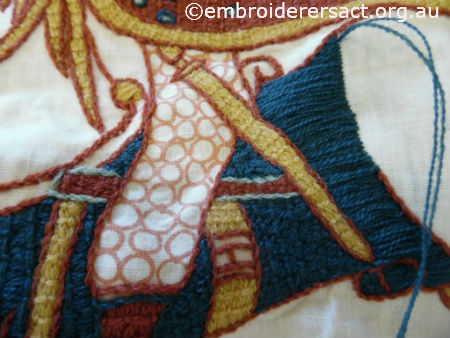 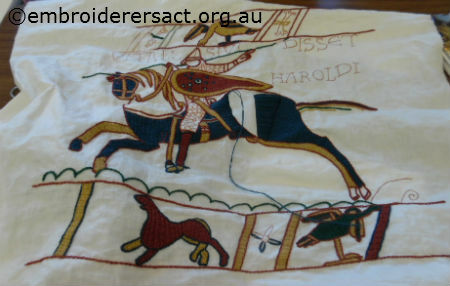 We have had a previous blog about the Bayeux Tapestry, which you can find here. 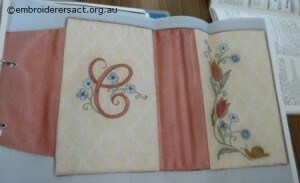 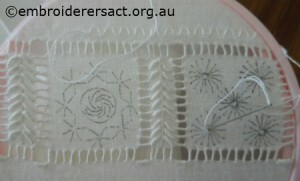 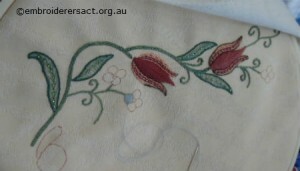 Claire Westley worked on her Portugese Whitework, and some Canvaswork which came out of a NSW Embroiderers’ Guild class on basic embroidery techniques. 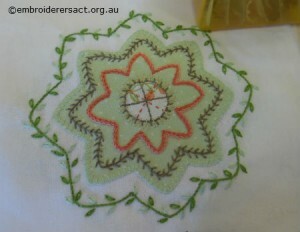 A sweet little panel for a pincushion by Di Ballantyne. 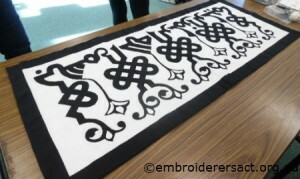 Even more creativity with this applique panel, pattern entitled Cairo Rug Makers, by Kate Ross. 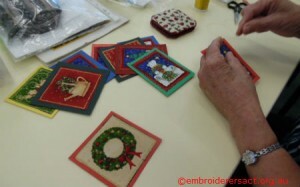 And coasters created by Susan Douds, painted with acrylic paints and sealed. 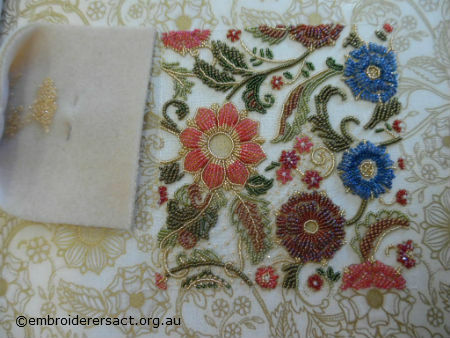 This panel was being prepared by Libby Williams, to be embellished with Goldwork. 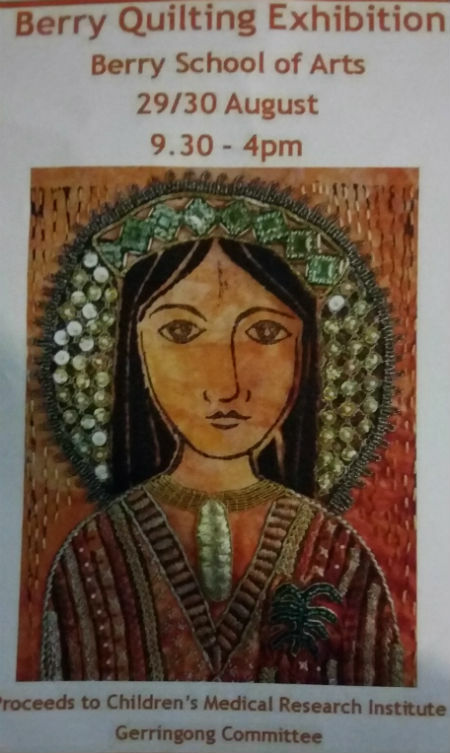 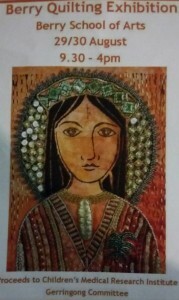 Libby’s panel of an embellished Angel has been used in the advertising for this year’s Berry Quilting Exhibition. 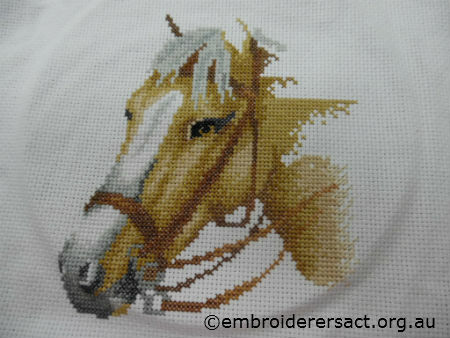 Well, that’s the end of my notes from Greenhills 2015, I hope you enjoyed the creativity and variety, and a big thank you to Brenda Phillips for her great job in organising another fun stitching get-together. If I’ve missed anyone, I apologise, but at least no-one can say that we sat around just eating and talking! 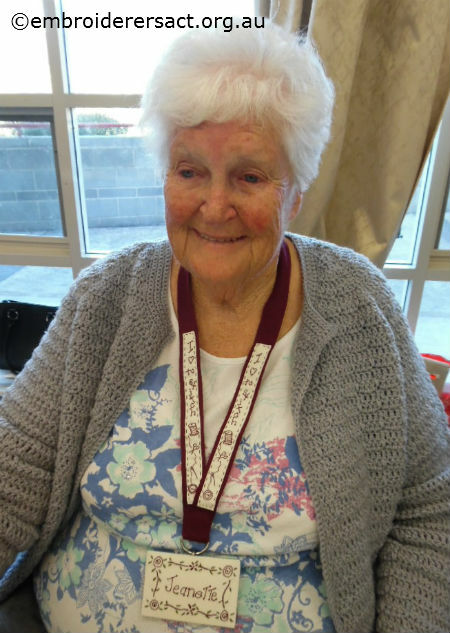 Look out for Greenhills again next year – members and friends, both old and new, are always welcome for a day, or the whole weekend.